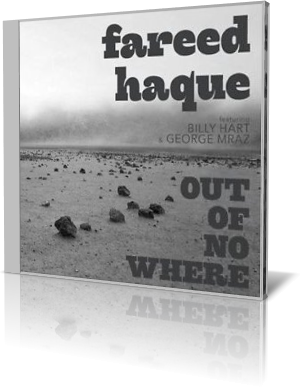 Deemed a modern guitar virtuoso, Fareed Haque goes on an adventure with Out of Nowhere (Charleston Square Recordings, 2013). Voted “Best World Guitarist” by Guitar Player magazine, he has toured with Zawinul Syndicate, Sting and Paquito D’Rivera. Haque goes with a trio format on half the songs and quintet for the other half. The trio includes Billy Hart on drums and George Mraz on bass. Bassist Doug Weiss contributes to “TexMex Jungle.” The quintet consists of Rob Clearfield, piano; Corey Healey, drums; John Tate, bass; and Salar Nader, tabla and percussion. “TexMex Jungle” has an upbeat, finger-snapping pace. The guitar appears to be layered as there is a rhythm track underneath the lead. Hart infuses some metronome quality rim shots. Weiss goes to town during his solo, snapping the strings with vigor. Haque demonstrates speed and accuracy as he puts the guitar through a series of high-speed rolls. The quintet takes on the Coltrane classic, “Giant Steps.” Haque’s haunting play, combined with an assortment of electronic sounds, make this one of the most unique interpretations. He adds a bit of wah-wah to the rhythm when Clearfield takes point. One of the atmospheric effects is what sounds like someone attempting to tune a two-way radio. 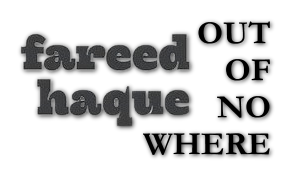 Haque was 50 at the time of this recording, Raised in Chicago by a Pakistani father and Chilean mother, he says he grew up playing jazz, blues and R&B on the Chicago scene. Those styles come through in different forms on Out of Nowhere.